Panettone, that Milanese specialty, is one of the quintessential Christmas breads, popular the world over. Italian bakers make an estimated 117 million of them every year, with countless others made and sold elsewhere, particularly in South America. The name, despite colorful legends that insinuate otherwise, translates to “large bread”; with loaves generally at least 6 inches tall, the name is apt. The texture of panettone is meant to be light and airy, and is typically dotted throughout with dried fruit and candied citrus, though other additions (such as chocolate) are common. The flavor is not over-sweet, nor is it over-rich despite the wealth of butter used in the dough, making a lavish smear of mascarpone an ideal topping for a wedge, toasted until just barely crisp. Traditionally, panettone is made with a starter that takes days of coddling to perfect, but today’s recipe uses a more straightforward (if only slightly shorter) approach. This recipe comes originally from Jim Lahey, of No-Knead Bread fame. This bread uses a similar long-rising technique, requiring 12 to 15 hours for the first rise. For some reason or another, my bread took much longer, approaching 24 hours. The second rise took approximately the listed time, 3 to 5 hours. All this lengthy rest, and the very wet dough, gives the bread a fantastic depth of flavor, along with a texture that is both fluffy and chewy, in the most wonderful way possible. Along with the tiny, gently boozy bursts of rum- and brandy-soaked dried fruit, the buttery flavor of this Christmas favorite is sure to make panettone a new holiday tradition to look forward to every year. 1. Place the raisins, golden raisins, and cranberries in a plastic zip top bag. Add the rum, brandy, and water, and squeeze as much air as possible out of the bag before closing. (This maximizes the surface area contact between the fruit and the liquor, and makes sure no fruit is left dry.) Soak at room temperature for at least 8 hours, and up to several days. When ready to proceed, drain the fruit, reserving the liquid. 2. In the bowl of a stand mixer, whisk together the flour, sugar, salt, yeast, and lemon zest. Add the eggs, water, honey, vanilla, and fruit-soaking liquid. Using the paddle attachment, mix at low speed until a rough dough forms, about 1 minute. 3. Switch to the dough hook attachment. At low speed, add the softened butter 1 tablespoon at a time, letting each piece incorporate completely before adding the next. Increase the speed to medium, and continue kneading until the dough is smooth and elastic, about 8 minutes. The dough should be slack, but not wet; add additional flour if necessary to achieve the proper consistency. 4. Add the soaked dried fruit, and knead at medium speed until evenly incorporated, about 2 minutes more. 5. Transfer the dough to a large, lightly oiled bowl. Cover tightly with plastic wrap, and let rise in a cold oven with the door closed for about 12 to 15 hours, or until the dough is nearly tripled in volume. 6. If using a paper panettone mold, have it ready. (Otherwise, prepare a round pan as described in note 1 below.) Dust the top of the dough with a little flour, and turn out onto a floured work surface. Sprinkle a little more flour over the top of the dough. 7. With floured hands, fold the outside edges into the center, pressing gently, and place seam side down into the panettone mold (or prepared pan). Cover loosely with lightly oiled plastic wrap, and let rise at room temperature until dough is just above the top of the mold (more than doubled in size), about 3 to 5 hours. 9. Place the dough in the mold on a baking sheet (to help insulate the bottom from the heat of the oven floor). Using a sharp serrated knife, gently and decisively slash a large “X” across the top of the dough, letting only the weight of the blade press into the dough. Take care not to deflate the dough. Place the 1 tablespoon chilled butter in the center of the X. 10. Bake at 370º F for 60 to 75 minutes, or until a wooden skewer inserted in the center comes out slightly moist, but not wet or doughy. The crust will be very dark (but should not be burned). 11. If using a paper mold, pierce two long metal skewers all the way through the panettone and through the papers, as close to the bottom as possible. Hang the panettone upside down over a stock pot or between two objects of equal height. Cool completely, then remove the paper and slice into wedges for serving. If using a metal pan, let the bread cool completely in the pan on a wire rack before slicing and serving. 1. If you happen to have a paper panettone mold (which is preferable), use it by all means. If you can’t find one, fold a long (approximately 30 inches long) sheet of parchment paper lengthwise into a strip 5 inches wide. Use this strip to make a tall collar in a greased 9 inch round cake pan, or springform pan. Proceed as directed. 2. Panettone should last for about 2 weeks at room temperature, tightly wrapped. It can also be wrapped and frozen; although when it begins to dry out, it makes incredible bread pudding or French toast. The only panettone I had ever tried is the commercial variety. And I wasn’t really into it, so when I started making this recipe, I had doubts whether we will like it or not. 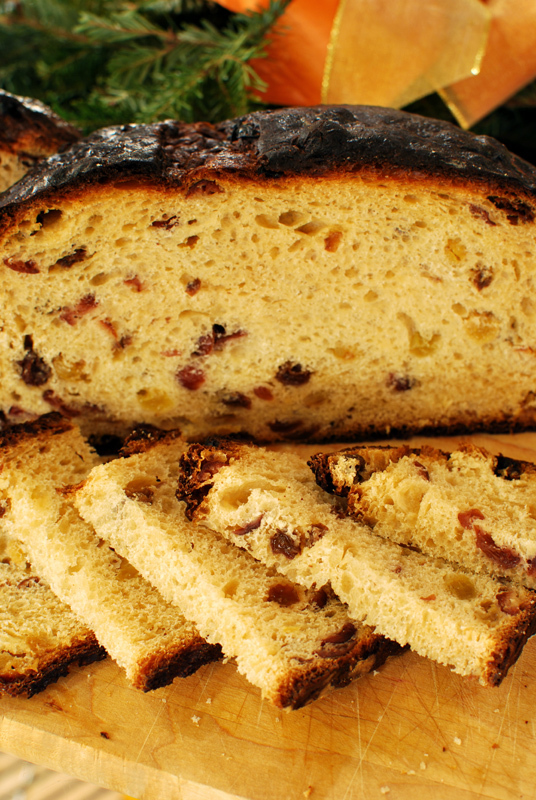 But THIS panettone is a gastronomic treasure! Too bad it all disappeared within 12 hours. Thank you Beth!